KVM2USB product is a compact device that conveys the VGA stream from any host computer to a laptop, while emulating the laptop's keyboard and mouse outputs. Optional USB cables are included for USB keyboard and mouse support. VESA modes: 720x400, 640x480, 800x600, 1024x768, 1152x864, 1152x900, 1280x960, 1280x10241. Custom VGA modes. 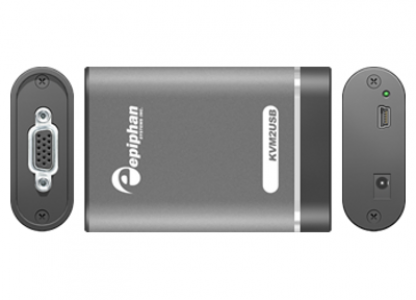 Epiphan Systems' KVM2USB product is a compact device that conveys the VGA stream from any host computer to a laptop, while emulating the laptop's keyboard and mouse outputs. KVM2USB is a truly portable crash cart. Now, all you need to take with you on administrative site visits is your laptop, the KVM2USB device (roughly the size of a box of paperclips) and the accompanying cable. The product provides a simple, lightweight and rapid means of conveying VGA images from host machines to a laptop and simulating the laptop's keyboard and mouse outputs. This allows administrators and technicians to quickly and easily connect to—and administer— headless machines without hassles. As a compact external device, KVM2USB is easy to use and to transport. About the size of a box of paperclips, it is easily plugged in and requires no additional powers. The product ships complete with all required hardware and cabling. Software development kits are also available for specialised applications.